With a foray of over 25 years in the field of Paediatrics, Dr Rahul Nagpal comes to us armed with knowledge, experience and an impeccable clinical acumen. Dr Nagpals area of expertise spans General Paediatrics, Paediatric Intensive Care and Neonatal Intensive Care. 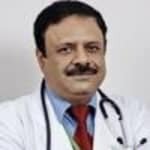 Dr. Rahul Nagpal is an experienced Pediatrician in Vasant Kunj, Delhi. You can meet Dr. Rahul Nagpal personally at Fortis Flight Liutenant Rajan Dhall Hospital - Vasant Kunj in Vasant Kunj, Delhi. Book an appointment online with Dr. Rahul Nagpal and consult privately on Lybrate.com. Lybrate.com has an excellent community of Pediatricians in India. You will find Pediatricians with more than 26 years of experience on Lybrate.com. You can find Pediatricians online in Delhi and from across India. View the profile of medical specialists and their reviews from other patients to make an informed decision. My baby girl is one month. She is crying always before urine starting from delivery. Can you please suggest me what's the reason. It is quite normal for the babies to cry while passing urine and motion as well. Nothing to be done. My three year old daughter has been given easy four tt vaccine yesterday morning now she has gives all over the body and etching. Dr. given evil injection and atarax oral. Still she is not filling well. Is this caring situation? Please suggest the year old daughter has been given easy four tt vaccine yesterday morning now she has gives all over the body and etching. Dr. given evil injection and atarax oral. Still she is not filling well. Is this caring situation? Please suggest. It is safe to give Dr. reddy pedicloryl to 6 month baby? How many ml I give to my baby? He is crying all d time day n night. Yes my dear friend, it is safest drug among all sedative medicine. Quantity depends on weight of baby not on age. If you will tell me weight, I will be able to tell about quantity. Before going this medicine you should confirm that baby is healthy. Baby may suffer from any disease, it is necessary to treat his problem first, then think about pedicloryl. Hope it will help you. My baby have gave 2.5 month vaccine at yesterday noon. She have around 99.5 fever till today, so is this thing to worry or its a common. Also how much day fever effect. Please let us know. Vaccines are organisms to fight various kinds of diseases but body usually treat these organisms as foreign bodies. The body fight off the strain of organisms injected through vaccines to give signs in the form of rise in temperature. When the individual is attacked by organisms, the body fights them back to save life of child. High temperature kills bacteria and viruses which thrive in the body at normal temperature. Rise in temperature help the body to produce more white blood cells, antibodies and other infection-fighting agents for infants’ protection. In fact, fever is beneficial in infants after vaccination.Dont wory it will subside automatically in a day or two. Is Actinomycosis Contagious? How Can It Be Treated? Actinomycosis once in a while shows up in other parts of the body. However, it can spread from the underlying affected area to different parts of the body if any sickness or a disease harms your tissue. Actinomycosis is not infectious. It is essentially found in the tropical regions of the world. High-dosage penicillin regulated over a drawn-out period (six months to one year) is the basis of treatment for actinomycosis. These symptoms were produced when patients with actinomycosis were commonly late over the span of sickness with extensive injuries. They frequently accepted discontinuous anti-infection treatment. What is more is the advanced imaging devices were not accessible to screen treatment. Accomplishment with shorter courses of treatment (less than six months) has been accounted for, particularly in cervicofacial actinomycosis. Anti-infection agents that have no action against Actinomyces species include metronidazole, aminoglycosides, aztreonam, co-trimoxazole (TMP-SMX), penicillinase-safe penicillins (eg, methicillin, nafcillin, oxacillin, cloxacillin), and cephalexin. Penicillin G (Pfizerpen, Bicillin). It is one of the best treatments for actinomycosis. It reacts with the cell synthesis called the mucopeptide during active multiplication, bringing about the bactericidal movement against helpless bacteria and thus eliminating them. Doxycycline (Bio-Tab, Doryx, Vibramycin).For non-pregnant patients with penicillin sensitivity, it hinders protein combination and, along these lines, bacterial development by authoritative to 30S and perhaps 50S ribosomal subunits of defenseless bacterial organisms. Clindamycin (Cleocin). Suggested for patients with hypersensitive to penicillin, Lincosamide hinders bacterial development, by blocking separation of peptidyl t-RNA from ribosomes. This brings about RNA-subordinate protein synthesis to an arrest. Disadvantage of this is the absence of coverage against some surrounding bacteria. My daughter is 6 years old. She is a patient of ahd (size 10mm). My question is which one is the best option either open heart surgery or a device? how long she will be admits in hospital? and what is the cost? please Reply. Did you mean asd? asd closure can be safely done by a device and the child can be discharged in a day or two, preferable to do in a hospital with expertise and facilities to do device closure in children, cost can vary from 60k to 1 lakh depending on the type of centre. A cough of 7-8 days should be treated after examination of the child. The child may also need X-ray chest. Is there any fever? wheeze ? You may have to give a short course of antibiotics too. Sir, I have twin (Boy & Girl) born on 02.05. 2015. They are taking Breast feeding & Pronan 1. But, sometimes they after feeding hiccup. Is it normal? We use to give them Boil water after cooling. After taking the water the hiccup stop. Is it correct method? Hiccups occur due to irritation of diaphragm after feeding. I think you are over feeding. You can feed only with breast milk and you shouldn't give water either boiled or not boiled. I want to ask one question about my son he is 10 month's Old now. Is gripe water is good for infants as I heard in facebook that gripe water is not good for child health. And also please assist Me the good syrup so that my son stomach get cleared digested as he is not doing potty for 2-3 days. Don't give him blended meals. Include roughage in his diet. Give him whole grains like veg daliya, fresh fruits, veggies, curd & buttermilk enhances good bacterias in the body & accelerate digestion.